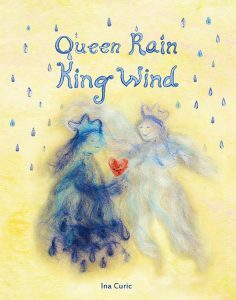 “Queen Rain King Wind: The Practice of Heart Gardening” – a children’s book for people of all ages – brings appreciation as harmony building practice at family level. A felt art illustrated story about elves that gift the appreciation game up to King Wind and Queen Rain to help them solve their disputes. Appreciation is the smallest, easiest step to lay a foundation for great peacework. From the family level up to international relations. “The one thousand miles journey starts with the first step” says the well known Chinese proverb. One appreciation circle every day goes a long way to establish a foundation of harmony in any family, developing emotional intelligence, a vocabulary for emotions and needs in a safe space to express, share and be seen. Some issues and challenges are more difficult to solve than others. Sometimes the parties to a conflict, the members of a family in dispute, cannot even hear each out anymore. Appreciation is not a magic formula to dissolve misunderstandings and especially not power dynamics – which need to be addressed separately. Issues still will have to be worked through, needs negotiated, feelings expressed. 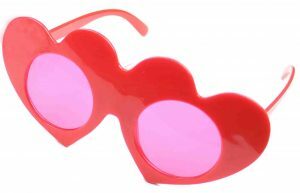 What appreciation can do though comes close to an everyday miracle: there is no greater magic than to be able to see with the eyes of love. Appreciation lays out a green carpet to walk on instead of the red former battle field with words. By coming together and connecting on a reason & heart level combined – harmony can be weaved back into relationships. An appreciation song accompanies the story to inspire daily practice. That is all it can take. A daily dose of appreciation to bring magic over any situation. “What do you have to do to reach Enlightenment?” asks the disciple. Here’s a story to inspire a small practice for a great outcome. Daily. 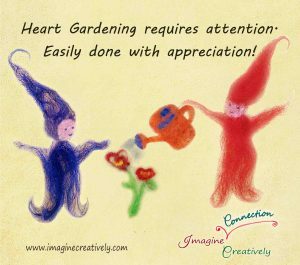 Heart Gardening season all year round. Queen Rain and King Wind are working together for the benefit of all beings. “Queen Rain Kind Wind: The Practice of Heart Gardening“ – See storybook description and editorial reviews here. Sign up for the free appreciation song accompanying this story here. Get the book on amazon. Available in hard cover, paper back & ebook.